You don’t feel great. Maybe you have aches and pains, low energy, trouble sleeping, digestive issues or trouble managing stress. You know you need to be moving your body, but you simply don’t have time for exercise, or you have injuries that make exercise difficult. Your poor health is keeping you from showing up for life in the way you want to! You want to bring your best self to your family, friends and passions, but your health is getting getting in the way. I get it! I have been where you are. Seven years ago, I was a mess. I was working (more than) full time as a Tax Director for a public accounting firm AND running a martial arts and yoga studio with my husband. I was teaching six yoga classes a week, plus doing my own home practice. (So, it wasn’t like I was a couch potato!) I was EXHAUSTED. I caught every bug that was going around. I couldn’t walk long distances without extreme pain in my left ankle, from a childhood injury. I was STRESSED. I felt like my life was out of control, and I was constantly struggling to keep up. My triglycerides were high, and I took way too much Excedrin for near daily headaches. I did not FEEL well. Then, my first child was born and I decided to make some changes. Slowly but surely, I discovered the power of weaving healthy movement into the fabric of my day, and my health and life improved dramatically! You’ll spend about five minutes each morning learning the daily challenge. Then, you’ll weave the exercise into your day, striving to do it five times throughout the day. So simple and yet so powerful! Enrollment in this challenge is available for a single payment of $79! “Doing small “breaks” of yoga throughout the day is so much more doable for me than an hour, and I love the point made about focusing on it throughout the day as opposed to doing yoga for an hour then spending the rest of the day undoing all that was done! I’m so excited to make this a part of my life!” ~ Kathryn K.
“I am impressed with the instruction, the website, and emails. Jennifer’s voice is encouraging and soothing. The Mini Yoga Break: Increase Pelvis Mobility is amazing. I have never seen this move, and it helped my chronic pain the first time I did it.” ~ Alison H.
“Thank you, Jennifer, for the wonderful classes! As a fitness nerd, instructor and trainer, I’ve tried a lot of different yoga programs. Yours if by far the best. Your instruction and cueing is awesome. Thank you for keeping the tone of your sessions intentional, but not religious.” ~ Kate W.
“I am amazed. I don’t think I’ve ever experienced such gracious permission to relax in a practice before – it brought up a big emotional release. Thank you.” ~ Tiffany H.
“I just did one of the mini yoga breaks (Breath of Joy) and feel so revitalized. Such a blessing at 33 weeks pregnant…I’m now ready to go play outside with my little guy.” ~ Michele L.
I am already a Healthy Moving Coaching & Challenge Program Lifetime member. Do I need to register for this challenge? Nope! 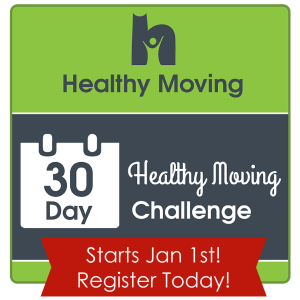 This challenge is included in the Coaching & Challenge Program at no additional cost. You will automatically receive all the emails and content for this challenge. 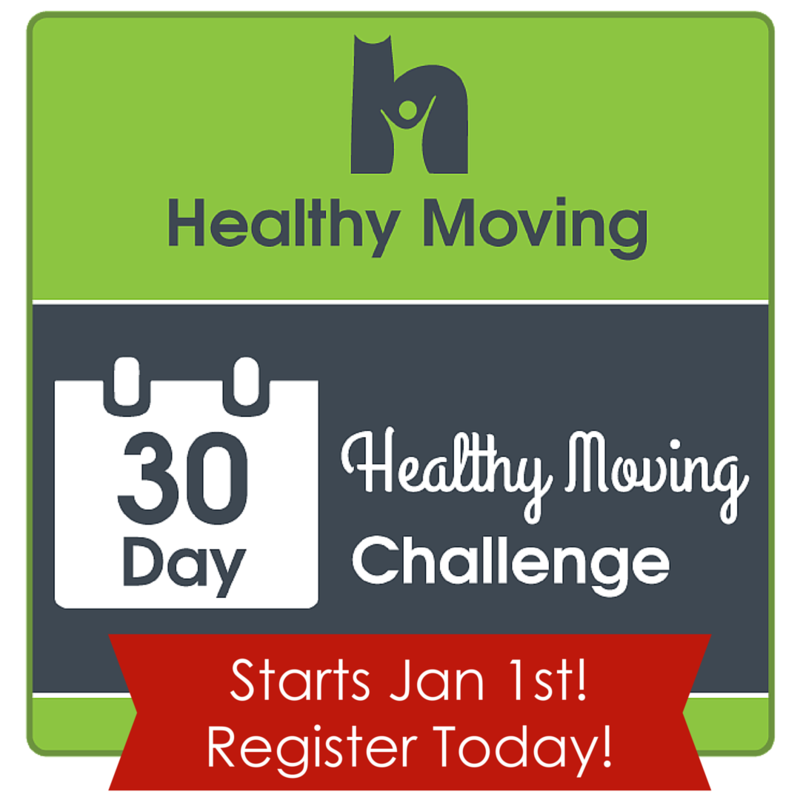 We will all begin the challenge together on January 1st. After you register, you’ll receive an invitation to opt-in to the challenge email list – be sure to do that, so you don’t miss a beat! How long will I have access to the 30-Day Challenge content? The challenge pages and content open and accessible for 90-days (through 4/1/16). The workbook is yours to download and keep forever. And, you are welcome to watch the challenge videos and bonus class as many times as you like during the 90-days. What happens if I miss a day during the challenge? No problem! Just jump in with the current day’s challenge. Thankfully this isn’t high school math. If you miss one lesson, just jump in where we are, and watch the missed content when you have time. How much time will this take me everyday? Plan to spend about 5 minutes each morning learning the daily challenge. Each exercise is very simple, and can usually be done while you live your life (at the office, in the kitchen, the car, the grocery store). You’ll aim to weave the daily challenge in five times during the day. How does the 14-Day Money-Back Guarantee work? Congratulations! I sure do. In fact, I was pregnant during the filming of many of the Healthy Moving videos you’ll see in the challenge! It is so important to move your body during pregnancy, and I’m here to support you on that journey! Do I need any props or equipment?